Ride into the future with NSBA Smart Points! 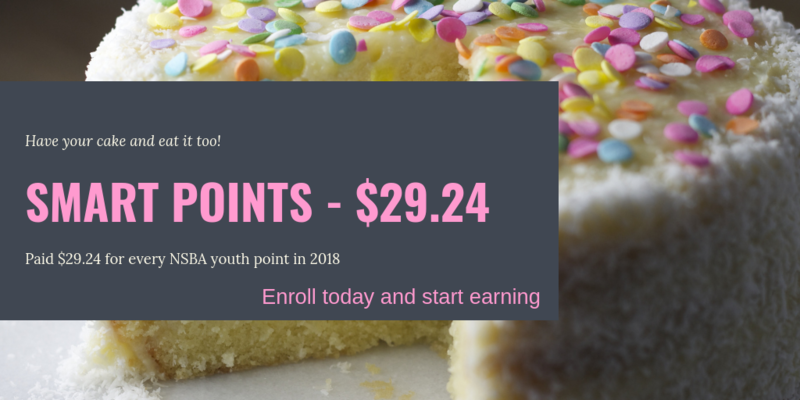 2018 Payout was $29.24 per point! NSBA rewards youth members for their participation in NSBA programs and encourages them to become lifelong learners through the Smart Points program. Youth rider may apply by paying a one-time fee of $25 and completing the enrollment form. Enrollment can occur at any time throughout the year. Youth riders must have a NSBA membership, enroll in the Smart Points program and either ride a NSBA Stallion Incentive Fund (SIF) Licensed horse or register their horse into the Smart Points program in order to earn Smart Points money. The name on the Smart Points enrollment and NSBA membership must be exactly the same. Each NSBA point that the youth rider earns in a Dual Approved or other designated youth class will earn a money value, including Novice youth and walk-trot classes. NSBA Smart Points also sponsors the National Youth Activity Team Tournament (NYATT) at the All American Quarter Horse Congress, the Youth Team Tournament at the APHA Youth World Show. This sponsorship allows the youth to enter and earn NSBA points towards the Smart Points program as well as year-end awards. NSBA uses the sanction fees from all youth classes that are collected by show management at NSBA events to create the "pot". The sanction fees are six percent of each youth entry fee, or a minimum of $3 per youth entry. To enroll in the Smart Points program, download the form below. Youth members will supply basic information such as their name, address and date of birth and send completed form along with $25 fee to the NSBA office. If your horse is enrolled in the Stallion Incentive Fund, transfer the horse into your name. If your horse is not enrolled in the Stallion Incentive Fund, you can enroll your horse for a one-time enrollment fee of $200. Smart Points horse enrollment is non-transferable. Participating youth receive an annual printout of their earnings. Those who "age out" of the youth program will automatically be mailed their accumulated earnings the year after they turn 18. The payout will be sent to the Smart Points participant at the address on record with NSBA. Please contact NSBA if the youth member's address changes. If the Smart Points total is greater than $600, the former youth will receive a 1099 to submit for tax purposes. Any earnings that are eligible for payout and remain unclaimed are moved to the NSBA Scholarship Fund annually.